A year ago I had a discectomy this was because when I walked my right foot was slapping only it went totally opposite and now I have no control what so ever.I have tried different splints but due to me having a bunion which as progressed very quickly I have not been able to wear.The problem now is after being seen by a consultant to have a tendon transfer I was told that until I wear a splint this operation won't happen.in the meantime the bunion developed a cut and became bigger so after turning to my gp and asking for help she got me an appointment with a podiatrist who now says he,s not prepared to do bunion surgery without the consultants say so due to the fact that I would need complete rest and my muscles won't be used and so there's a chance I may not walk again.My big toe as pushed inwards causing my foot to swing out and until my foot is straight I can't have the tendon transfer.I am now stuck as to where to go next I am so depressed and won't go out because I trip up and fall.Please could you give me any advice what I can do. I am making my response based on the information you have supplied me, but there seems to be things missing as the advice you have been given does not make sense to me. 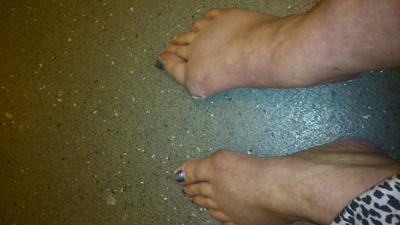 In spite of your bunion deformity there is no reason you could not have worn a brace for your drop foot. If part of the brace is bothering your bunion or creating too tight a space in your shoe for both the bunion and the brace, then either you could have tried a wider or longer shoe or part of the brace could have been cut away to take pressure off the bunion but still be effective in holding up your foot. You need a doctor with a little creativity. I am not sure what type of bunion procedure your podiatrist has in mind for you. I would like to have seen x-rays but even with just viewing images of your foot, it is apparent you have a large bunion deformity. be able to wear a brace. With that in mind, if I were your podiatrist, I would have chosen a joint destructive procedure like a Keller bunionectomy (you can ask your doctor what that is), which is a great procedure in older individuals where we are looking to reduce the pain of a bunion along with reducing much, but not all, of the protrusion of bone on the inside of your foot. I would choose this procedure because in rehabbing after this surgery, we want the patient to start ambulating as soon as possible, not laying around for weeks and months. Unlike other more involved procedures where we surgically break and re-set bone which may require non-weightbearing and much rest, with a Keller bunionectomy, no bones are being broken, so there is no worry about bearing weight from day one. Yes, like any bunion procedure, there will be varying degree of pain after the surgery, but most of my patients are able to start walking within two to three days. In fact I encourage walking because that helps get the big toe moving and helps prevent stiffness. Your case would be a little more difficult because you would start walking, but with the use of a splint, so there is little probability that you would have much motion in the big toe joint anyway. So, I am not sure what your podiatrist is talking about when he says you would need much rest and this would weaken your already weakened muscles. The only thing that I can think of is that he wants to perform a much more involved procedure which essentially serves no purpose given your situation, or, he does not want to do any surgery and is trying to talk you out of doing anything. The problem with the latter suggestion is that your bunion is getting worse and something needs to be done, as well as the fact that the bunion is getting in the way of you wearing a brace and you will need to wear a brace in order to go ahead with the tendon transfer. Perhaps your next move should be to find a foot specialist who is willing to do a more conservative procedure on your bunion which will allow you to start walking immediately; once your bunion is fixed, then you can concern yourself with having your tendon transfer.